Already known of in the Medi­ter­ranean region since the Bronze Age, the old­est iron arte­facts in Thuringia date to the 7th/6th cen­tur­ies BC – for example, the remains of a knife found among cremated remains in a burial mound in south­ern Thuringia. The util­isa­tion of iron didn’t really gain momentum in Thuringia until the 2nd or 1st cen­tury BC. In con­trast to bronze or cop­per, iron ore was eas­ily obtain­able and sources com­mon. As such, unlike other metals, iron wasn’t a mater­ial con­fined to the upper classes. A major advant­age of iron was its hard­ness. This prop­erty made it ideally suited for the pro­duc­tion of weapons, tools, and har­vest imple­ments. Archae­olo­gists divide the Iron Age into two epochs based on two import­ant sites: the Hall­statt, fol­lowed by the La Tène. The Hall­statt saw iron become estab­lished in Thuringia. The La Tène is dis­tin­guished by its dis­tinct­ively artistic dec­or­at­ive style. The La Tène was an import­ant factor in the flour­ish­ing of the Celts. In the ALT you will be amazed by the Celtic torcs and fib­u­lae! 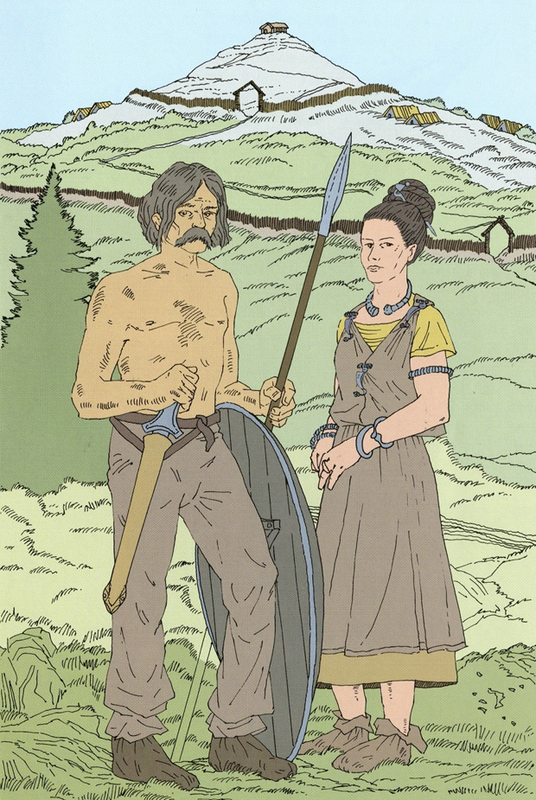 The Celts were also the first to use iron in Thuringia and drove its spread. Their arte­facts are present in buri­als in the Orla region in south­ern Thuringia, among oth­ers at the largest archae­olo­gical site in Thuringia, the Steins­burg hill-fort near Roem­hild. Many crafts­men lived and worked in this set­tle­ment. You can see mod­els of the Steins­burg in the ALT. Under the influ­ence of clas­sical cul­ture from the Medi­ter­ranean region the Celts made many import­ant tech­no­lo­gical advance­ments. Examples include the intro­duc­tion of the rotat­ing potter’s wheel and of rotary mills (or querns). They pos­sessed mas­tery of tra­di­tional metal­work­ing tech­niques, like black­smith­ing and fine-for­ging. They brought the first glass jew­ellery and the first coins to the region. The pre-Roman Iron Age is also the period in which, for the first time in Thuringia, pre­his­toric peoples – Ger­manic as well as Celtic – are his­tor­ic­ally doc­u­mented. They were part of the Jastorf Cul­ture, archae­olo­gical evid­ence of which has been found in the area around the Saale and Ilm Rivers. They cremated their dead and the burial urns were interred accom­pan­ied by bronze and iron items typ­ical of the cos­tumes of this mater­ial cul­ture. Among these were weapons and jew­ellery styl­ist­ic­ally sim­ilar to those of the Celts. This reflects the fact that, between the 4th and 1st cen­tur­ies BC, Thuringia was a zone of con­tact between the Celtic south and the Ger­manic north. Stim­u­lated by the Celtic civil­isa­tion and char­ac­ter­ised by hill-fort set­tle­ments (or oppida), trade and crafts flour­ished in Thuringia up until the middle of the 1st cen­tury BC.